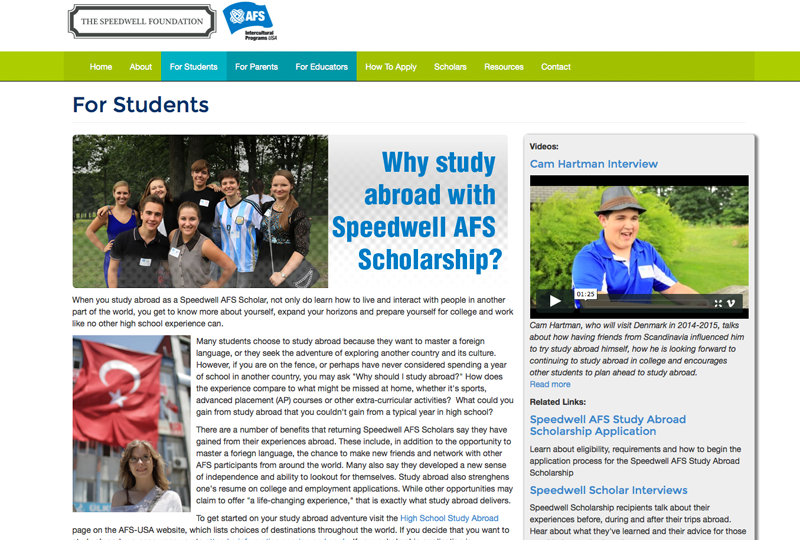 Inforest is proud to announce the launch of the Speedwell Foundation AFS Scholarship website (http://www.speedwellafs.org). The site describes a scholarship program offered to high school students in central Pennsylvania and coastal South Carolina to study abroad for one year in a country where English is not the primary language. The Speedwell Foundation was founded by Mike and Jenny Messner and the idea for the scholarships stemmed from Jenny’s own year abroad experience in Brazil. We really enjoyed working on the project as Inforest Communications was responsible for development of most of the content of the website, including interviews with current and returning scholars and starting information for students, parents and educators. We had the help from the great staff of AFS-USA in helping us better understand the program, as well as recording the interviews. What was most exciting about participating in the project was learning more about the students and their experiences studying abroad. Not only from interviews, but in finding and connecting to a number of blogs maintained during their experience. It’s amazing to learn about what motivates students to go abroad and how they go about getting the most out of the experience. These are some exceptional young people. The site was developed on the Drupal Content Management Framework. We appreciated the flexibility Drupal offers in designing, referencing and displaying different content. Since much of the event and blog content comes from other sites, the nimbleness of the Feeds Module was extremely helpful in developing the site.